Ever wish you had learned a second language as a kid. Even after years of French I think I can only repeat, oui! Give your kids a head start with the Mandy and Andy books, a new bilingual book series written by Florida-based grandfather William J. Adams and illustrated by Philadelphia-based cartoonist Tom Stiglich. The books feature rhyming stories accompanied by large, colorful drawings. Each book has two sides—one in English, and one in Spanish, so kids can read the story first in English, then flip it over and read it again en Español. 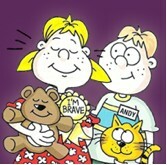 Mandy and Andy are twins who go through bilingual adventures together. In the first book, Hate That Thunder, blonde-pigtailed Mandy hides under her bed during a storm, but eventually confronts her fear of the loud thunder. In the second, Goin’ to the Zoo, the twins spend a day visiting animals at the zoo. In addition to the story, a glossary of English to Spanish words. Though the rhymes are sometimes clunky and the text is strangely laid out, the stories are fun and the illustrations engaging. It’s simple enough for small children to read, and the vocabulary in the second book is especially easy to teach kids. If you’re looking for a way to introduce a second language to your kids, the Mandy and Andy books are a fun, easy way to start learning a lifelong skill.